Providing you the best range of hepcinat, sofovir, daclatasvir 30mg, sofosbuvir tablet, daclatasvir 60mg and ledipasvir 90mg sofosbuvir 400mg with effective & timely delivery. With the aid of our modern infrastructure and dedicated workforce, we present clients with the premium quality of Hepcinat. 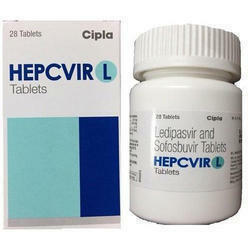 In combinations with other drugs, Hepcinat is used for treatment of Hepatitis C Virus (HCV) infection. Owing to higher cure rate, compositional accuracy and enhanced shelf life, Hepcinat is highly demanded. Sofovir is a prescription drug and should be used under proper medical guidance and advice.. Backed with years of experience of this domain, we provide clients with the premium quality of Daclatasvir 30mg. 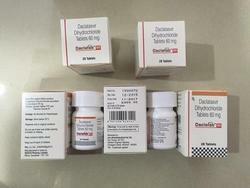 For effective treatment of cancer, the offered Daclatasvir is used in hospitals and nursing home. Known for its compositional accuracy and high effectiveness, the Daclatasvir is fabricated by using latest technology. 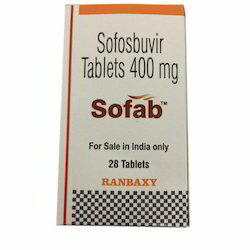 sofosbuvir is an antiviral medication that prevents hepatitis C virus (HCV) cells from multiplying in your body. is used in combination with other medications to treat hepatitis C in adults. 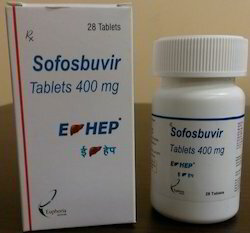 Sofosbuvir is sometimes used in people who also have HIV, or people who have liver cancer and are going to have a liver transplant. This medicine is not a treatment for HIV or AIDS. 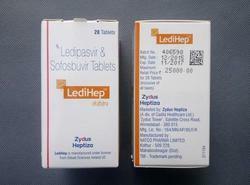 is also used together with Daclatasvir to treat hepatitis C genotype 3 infection in adults. You should not use you are allergic to sofosbuvir. if you have recently used a heart rhythm medicine called . is used in combination with ribavirin. Ribavirin can cause birth defects or death in an unborn baby. You may need to have a negative pregnancy test before using these medications together, and every month during your treatment. If you are a woman, do not use with ribavirin if you are pregnant. If you are a man, do not use this drug combination if your partner is pregnant. An unborn baby could also be harmed if a man fathers the child while he is taking ribavirin. Use at least 2 effective forms of non hormonal birth control (, diaphragm with spermicide) while either partner is using these medications together. Keep using 2 forms of birth control for at least 6 months after treatment ends. Tell your doctor right away if a pregnancy occurs while either the mother or the father is using with ribavirin. -Sofosbuvir should be used in combination with ribavirin or with pegylated and ribavirin. -Efficacy was established in patients with HCV genotype 1, 2, 3, or 4 infection, including patients with hepatocellular carcinoma meeting Milan criteria (awaiting liver transplantation) and HCV/HIV-1 coinfected patients. -and ribavirin therapy for 24 weeks can be considered for patients with genotype 1 CHC who cannot use an -based regimen; treatment decision should be guided by benefits/risks assessment for the individual patient. -and ribavirin therapy is recommended for patients with hepatocellular carcinoma awaiting liver transplantation to prevent posttransplant HCV reinfection. 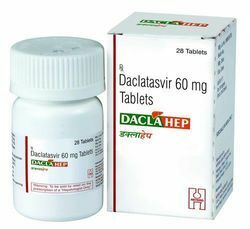 Daclatasvir is a drug for the treatment of hepatitis C (HCV). It is approved for Hepatitis C genotype 3 infections. Daclatasvir has been tested in combination regimens with pegylated interferonand ribavirin,as well as with other direct-acting antiviral agents including asunaprevir and sofosbuvir. Relapse rates are affected by baseline host and viral factors and differ between durations of therapy for some subgroups. Therapy-experienced patients are those patients who have failed treatment with either peginterferon alfa/ribavirin or peginterferon alfa/ribavirin/HCV protease inhibitor. 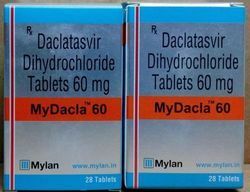 Mydacla (Daclatasvir) is a drug for the treatment of hepatitis C (HCV). It is approved for Hepatitis C genotype 3 infections. 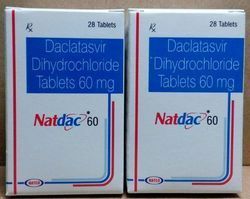 Natdac (Daclatasvir) is a drug for the treatment of hepatitis C (HCV). it is approved for Hepatitis C genotype 3 infections. Daclatasvir has been tested in combination regimens with pegylated interferonand ribavirin, as well as with other direct-acting antiviral agents including asunaprevir and sofosbuvir. 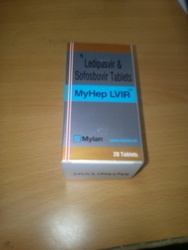 Assisted by our seasoned pharmacists, we are offering a distinguished Myhep Lvir Tablet. This is well known as an accurate composition of appropriate chemical compounds and natural substances. It should be used under proper medical guidance and advice. The offered tablet is rigorously tested on diverse parameters of quality ensuring its effectiveness. Moreover, the offered tablet is available as per the needs of clients at affordable price. 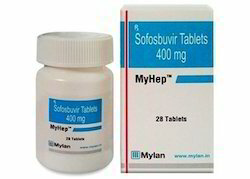 Myhep are containing the active ingredient sofosbuvir is a nucleotide polymerase inhibitor type of antiviral medication used to treat Hepatitis C. The medication must be used in combination with other antiviral medicines to reduce the amount of hepatitis C virus (HCV) in the body to help the liver recover. Chronic hepatitis C infections can cause serious liver problems such as liver cancer or cirrhosis (scarring). Patients with HIV or liver cancer and are going to have a liver transplant may also use the drug to decrease the risk of reinfection after the transplant. 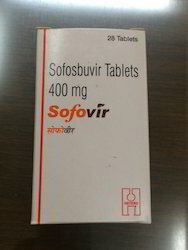 Uses:- Sofovir 400mg Tablet containing the active ingredient sofosbuvir is a nucleotide polymerase inhibitor type of antiviral medication used to treat Hepatitis C. Sofovir Tablets must be used in combination with other antiviral medicines to reduce the amount of hepatitis C virus (HCV) in the body to help the liver recover. Chronic hepatitis C infections can cause serious liver problems such as liver cancer or cirrhosis (scarring). Patients with HIV or liver cancer and are going to have a liver transplant may also use the drug to decrease the risk of reinfection after the transplant. Side Effects :- Nausea, Diarrhea, Headaches, Loss of appetite, Lower back or side pain, Insomnia,Fever. 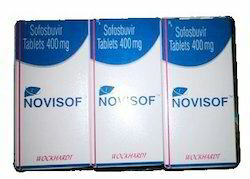 Novisof 400mg Tablet containing the active ingredient sofosbuvir is a nucleotide polymerase inhibitor type of antiviral medication used to treat Hepatitis C. Novisof Tablets must be used in combination with other antiviral medicines to reduce the amount of hepatitis C virus (HCV) in the body to help the liver recover. Chronic hepatitis C infections can cause serious liver problems such as liver cancer or cirrhosis (scarring). Patients with HIV or liver cancer and are going to have a liver transplant may also use the drug to decrease the risk of reinfection after the transplant. 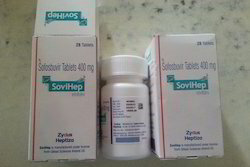 Sovihep 400mg Tablet containing the active ingredient sofosbuvir is a nucleotide polymerase inhibitor type of antiviral medication used to treat Hepatitis C. Sovihep Tablets must be used in combination with other antiviral medicines to reduce the amount of hepatitis C virus (HCV) in the body to help the liver recover. Chronic hepatitis C infections can cause serious liver problems such as liver cancer or cirrhosis (scarring). Patients with HIV or liver cancer and are going to have a liver transplant may also use the drug to decrease the risk of reinfection after the transplant. 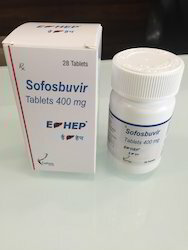 Sofab 400mg Tablet containing the active ingredient sofosbuvir is a nucleotide polymerase inhibitor type of antiviral medication used to treat Hepatitis C. Sofab Tablets must be used in combination with other antiviral medicines to reduce the amount of hepatitis C virus (HCV) in the body to help the liver recover. Chronic hepatitis C infections can cause serious liver problems such as liver cancer or cirrhosis (scarring). Patients with HIV or liver cancer and are going to have a liver transplant may also use the drug to decrease the risk of reinfection after the transplant. 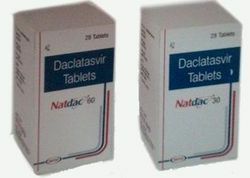 Daclafab (Daclatasvir) is a drug for the treatment of hepatitis C (HCV). It is approved for Hepatitis C genotype 3 infections. 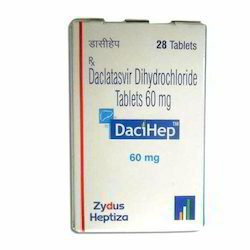 Hepcdac (Daclatasvir) is a drug for the treatment of hepatitis C (HCV). It is approved for Hepatitis C genotype 3 infections. We are a prominent industry, engaged in offering Hepcfix, widely used for treating chronic Hepatitis C virus infection. It is widely acclaimed by our clients for its diverse healing attributes. This is processed under the supervision of deft expert who have many years of experience in this field. Moreover, this is checked by our quality team, so that we can ensure our clients complete satisfaction. 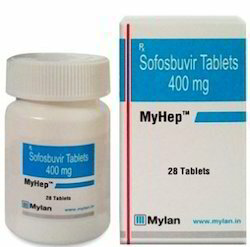 Uses:- Sofosbuvir 400mg Tablet containing the active ingredient sofosbuvir is a nucleotide polymerase inhibitor type of antiviral medication used to treat Hepatitis C. Sofosbuvir Tablets must be used in combination with other antiviral medicines to reduce the amount of hepatitis C virus (HCV) in the body to help the liver recover. Chronic hepatitis C infections can cause serious liver problems such as liver cancer or cirrhosis (scarring). Patients with HIV or liver cancer and are going to have a liver transplant may also use the drug to decrease the risk of reinfection after the transplant. Backed with years of experience of this domain, we present clients with the premium grade of E Hep Sofosbuvir 400mg. 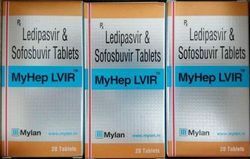 Used for treatment of HCV infection, the e hep Sofosbuvir is processed by using modern technology. Known for its compositional accuracy and enhanced shelf life, the rendered e hep Sofosbuvir is rendered with standard packaging. 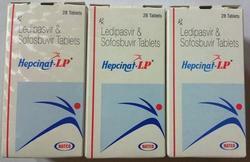 We are actively involved in offering an excellent range of Hepcinat LP Tablet. The offered products are provided to our valued clients in various packaging options. These products are highly used for the treatment of hepatitis C. Offered products are developed by utilizing optimum quality ingredients and advanced technology in line with medical industry defined standards. Furthermore, offered products are delivered within committed time limit to ensure clients' production process is not delayed. 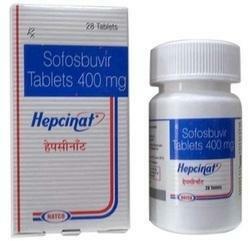 Uses Hepcinat (Sofosbuvir) is a breakthrough treatment for Hepatitis C infections. Its mechanism of action involves inhibiting the enzyme which is necessary for the virus if it is to multiply. A complete cure may even be possible. Chronic hepatitis C is a serious infection of the liver. We are a prominent industry, engaged in offering Daclahep, widely used for treating chronic Hepatitis C virus infection. It is widely acclaimed by our clients for its diverse healing attributes. This is processed under the supervision of deft expert who have many years of experience in this field. Moreover, this is checked by our quality team, so that we can ensure our clients complete satisfaction. 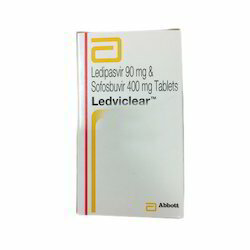 We are the foremost organization of highly effective Ledifos Tablets. This is processed using quality approved chemical compounds with latest techniques to ensure maximum effectiveness. It is highly demanded in medical industry and is widely used in the treatment of Hepatitic C Virus (HCV) Infection. Our offered medicine is freely soluble in liquid. Furthermore, the offered can be availed in diverse packaging options at economical prices. E-hep offers hope that you can put hepatitis C (Hep C) behind you. 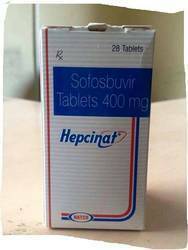 HEPCVIR 400mg Tablet containing the active ingredient sofosbuvir is a nucleotide polymerase inhibitor type of antiviral medication used to treat Hepatitis C.HEPCVIR Tablets must be used in combination with other antiviral medicines to reduce the amount of hepatitis C virus (HCV) in the body to help the liver recover. Chronic hepatitis C infections can cause serious liver problems such as liver cancer or cirrhosis (scarring). Patients with HIV or liver cancer and are going to have a liver transplant may also use the drug to decrease the risk of reinfection after the transplant. Use pirfenidone as directed by your doctor. Check the label on the medicine for exact dosing instructions. An extra patient leaflet is available with pirfenidone. Talk to your pharmacist if you have questions about this information. Take pirfenidone by mouth with food. Pirfenidone works best if it is taken at the same time each day. 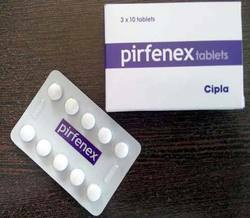 If you miss a dose of pirfenidone, take it as soon as possible. If it is almost time for your next dose, skip the missed dose and go back to your regular dosing schedule. Do not take 2 doses at once. If you miss 14 or more days of pirfenidone, call your doctor to find out what to do. Ask your health care provider any questions you may have about how to use pirfenidone. Treating chronic hepatitis C virus (HCV) infection in certain patients. Myhep Tablet must be used with ribavirin or in combination with peginterferon alfa and ribavirin. Mylan recognizes the urgent need to expand access to high quality, affordable Hepatitis C treatment options in India, where roughly 12 million people are infected with the virus. MyHep LVIR™ is an important addition to our growing Hepato Care segment in India that gives us the opportunity to offer patients the potential to be cured through a transformative and simplified single tablet, once-daily treatment regimen. Moreover, consistent with our commitment to create better health for a better world, we are introducing various educational initiatives in India to raise awareness of the disease and its treatment options." 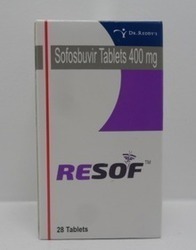 Resof 400mg Tablet containing the active ingredient sofosbuvir is a nucleotide polymerase inhibitor type of antiviral medication used to treat Hepatitis C. Resof Tablets must be used in combination with other antiviral medicines to reduce the amount of hepatitis C virus (HCV) in the body to help the liver recover. Chronic hepatitis C infections can cause serious liver problems such as liver cancer or cirrhosis (scarring). Patients with HIV or liver cancer and are going to have a liver transplant may also use the drug to decrease the risk of reinfection after the transplant. We are a prominent industry, engaged in offering Dacihep, widely used for treating chronic Hepatitis C virus infection. It is widely acclaimed by our clients for its diverse healing attributes. This is processed under the supervision of deft expert who have many years of experience in this field. Moreover, this is checked by our quality team, so that we can ensure our clients complete satisfaction. 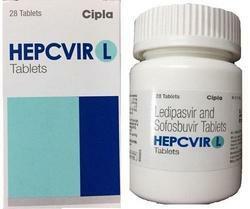 Hepcivir L Ledipasir 90mg And Sofosbuvir 400mg that basically work by reducing the amount of hepatitis C virus in your body. It is used to treat chronic (long-lasting) hepatitis C, a viral infection of the liver & sometimes be used with another antiviral medication (ribavirin). 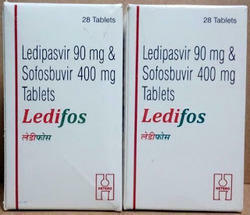 Our offered Hepcivir L Ledipasir 90mg And Sofosbuvir 400mg is available in various doses and can be availed in different packing options in large quantities at rock bottom price from us.